A Custom Date-a-Month Love Calendar Gift Card makes the Perfect Gift! Share the gift of love with a Custom Date-a-Month Love Calendar Gift Card so they can select 12 Date Ideas they’d enjoy for their Love Calendar! Makes a great gift for weddings, anniversaries and holidays! Now you can give the Gift of Love to someone as a Custom Date-a-Month Love Calendar Gift Card! 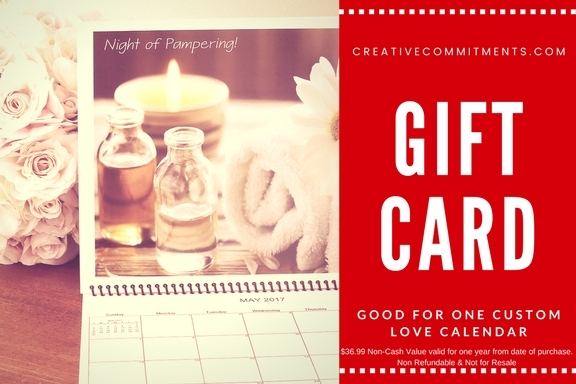 You will receive a pretty gift card via email with a discount code that will cover the entire cost of one custom Date-a-Month Love Calendar that includes shipping*!